Clare County was set off in 1840 as Kaykekee County from Mackinac County. It was renamed Clare in 1843 after County Clare in Ireland. It was officially organized in 1871. Farwell was the first county seat; in 1877 the county seat was moved to Harrison. For CLARE COUNTY INFORMATION, please visit the Clare County Michigan Business Associations. 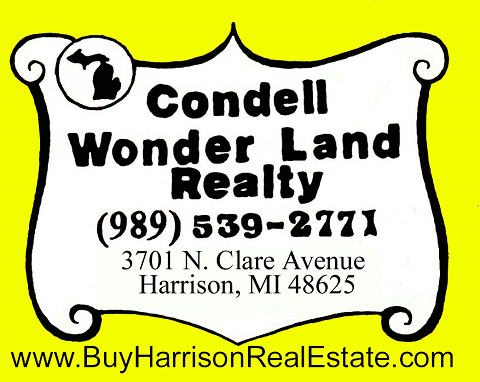 Condell Wonder Land Realty has a great selection of all types of Northern Michigan Real Estate and has been listing and selling Clare County MI. Real Estate for many years, so if you are looking to buy or sell property in Clare County MI. please contact us!